Visiting a bluegrass discussion list this week (“BGRASS-L, U. of KY>) reminded me that this year marks the 50th anniversary of the Kingston Trio’s hit Tom Dooley on Capitol Records. Many use this event to mark the beginning of the so-called “Folk Revival”, but that actually goes back to at least another 25 years or so. At any rate, the original song, Tom Dula, about a civil war veteran who murders for love, has long been claimed to be written by the grandfather of singer and instrument maker Frank Proffitt, who lived near a tiny town, Reese, NC. that doesn’t even exist any longer. Frank farmed tobacco and built mountain dulcimers and fretless five-string banjos out of maple he often cut himself from the hills surrounding his farmland. While I was working in Chicago at the Field Museum in 1962, Frank came up north for a 4-day visit and a concert at the Old Town School of Folk Music. I got to spend these four days with him, taking him on tours and learning a little about the way he picked banjo, guitar, and dulcimer. Frank was a very gracious guest and especially enjoyed the Field Museum’s huge collection of wild animal skins from around the world, house in two large rooms on the 4th floor of the building, far away from the general public. There was even a rinocerous skin, folded into a bale-sized lump and stiffend to woodlike hardness from the time it was contributed to the museum by Teddy Roosevelt in 1906. Frank talked about using groundhog skin for his banjo heads, saying it was pretty good but that cat skin was by far the best — though his wife refused to let him use it! Anyways, the story goes that Tom Dula, recorded by Proffitt via collector Frank Warner, was found by the Trio and used as a basis for their hit. Alan Lomax also published the song in his “Folksongs of North America”. Funny, fifty years doesn’t really seem like so long ago . . . This entry was posted in Ramblings and tagged Frank Proffitt, old time music, Old Town School of Folk Music, Tom Dooley, Tom Dula. Bookmark the permalink. We shouldn’t forget that, like so many other classic songs, TD was first recorded by Grayson & Whitter, about 75 years ago. Interesting post. Amazing how much influence Tom Dooley has had on music-how popular it was and is. banjo, Frank also played “mountain” dulcimer and guitar. still be available, so sit down and _listen_ to what he is doing. and hit the 1st string on the way up instead of a banjo thumb string. will see CD packages for both clawhammer banjo and Carter style guitar. 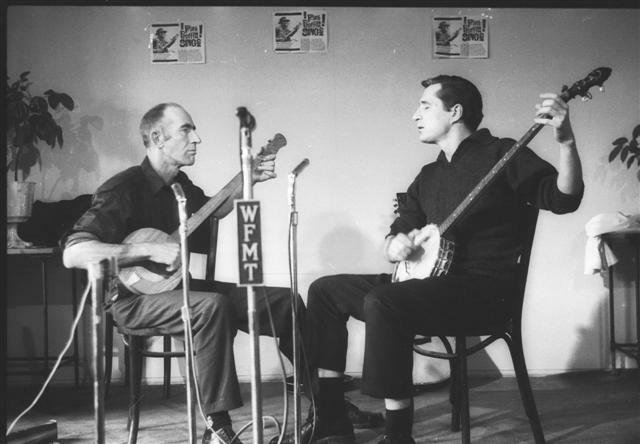 Please forgive me, but I’m working on a book about the history of the banjo with Bob Carlin and I noticed the image you have posted above of Frank Proffitt and Flemming Brown – would you be able to tell me where this image originally comes from as I’d love to try and license it for us in Bob’s book? Thanks for your comment and interest in the photo. I took that photo, early in 1962 when I lived in Chicago and spent a fair amount of time at the Old Town School. An article of mine on the school was published in _Sing Out!_ magazine that same year. Please contact me at my regular email address: [ peter@bluegrasswest.com ] and give me some idea re. your book. If you wish to use the photo, I can provide a hi-res scan directly from the original 35mm negative.